Dalhousie is a hill station in the northern state of Himachal Pradesh, India.The Dalhousie Town was named after Lord Dalhousie who was the British Governor-General in India while establishing this place as a summer retreat. St. John's Church, oldest church of the town carries immense historical significance. Constructed during the rule of Britishers in India, this church was founded by the protestant missionaries. Located amidst beautiful natural backdrop, this church is one of the most visited churches of the town. In addition, this church conducts services every Sunday. Rang Mahal, founded by Raja Umed Singh is located in Surara Mohalla. This palace was once the abode of a division of the ruling reign. 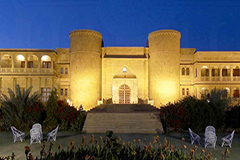 Tourists can see a perfect blend of British and Mughal style architecture in this palace. Dating back to 18th century, the walls of this palace are gnarled with fine exemplars of Punjab hill style wall paintings. These painting portray the life of Lord Krishna, which are the major attractions of this palace. 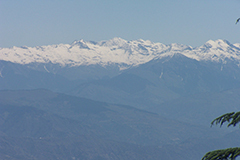 Kalatop is about 80000 m above G.P.O and is one of the places in near Dalhousie that has snow all year round. The only way to see Kalatop is on foot as most cars cannot go beyond a point because of the snow and if you plan to do the three day trek all the way to Khajjiar, then make sure you are trained for it. 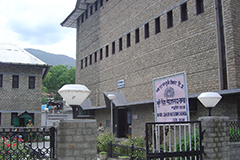 Bhuri Singh Museum, officially established in 1908, is named after the illustrious King Raja Bhuri. He was the one who contributed the compilation of paintings of his family to the museum. In addition, the museum also exhibits the inscriptions, which are in Sarda scripts. These scripts provide vital information on the medieval account of Chamba. The history of the region states that the Chamba rulers were great patrons of arts and culture. Laxmi Narayan Temple is a 10th century temple, which is constructed in the Shikhara style by Sahil Verman. 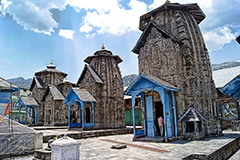 It is the oldest and the largest of all the temples located in Chamba region. The temple complex houses six shrines, which are either dedicated to Lord Vishnu or to Lord Shiva.Inside the temple, there is a main idol of Lord Vishnu, which is made using a rare piece of marble that has a glittering appearance. Kalatop Wildlife Sanctuary, located in the district of Chamba, is one of the most popular as well as most frequented sanctuaries in state of Himachal Pradesh. 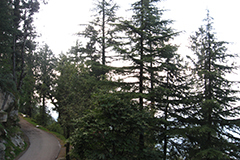 Popularly known as the Kalatop Khajjiar Sanctuary, the entire forest is covered with the thick foliage of deodar trees. In addition the sanctuary is also home to several animals and birds. Chamunda Devi Temple, situated on the banks of the beautiful Baner River, is one of the famous temples of the region, which is believed to 750 years old. Dedicated to Goddess Kali, who is the ferocious incarnation of Durga Devi, this temple is located in beautiful ambience. Tourists visiting the temple can also enjoy the beautiful sights of the mountains along with the woody forests of Lahl and Pathiar. 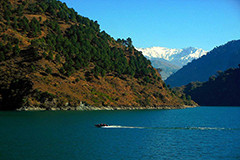 The Chamera Lake, located in Chamba District, is a popular tourist spot of Himachal Pradesh. Located at a distance of 25 km from Dalhousie, at an altitude of 1700 m, Chamera Lake is a reservoir formed by the Chamera Dam. 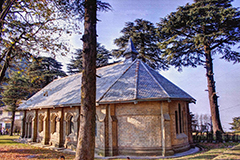 Being a major source of water supply for the villages surrounding the lake and continuously fed by the Ravi River, the water levels in the lake ranges at an average of 750 m.
St. Patrick's Church, located in Balloon falls under the area known as the Dalhousie Cantonment. 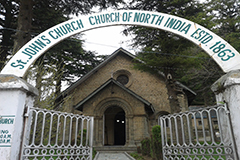 Situated approximately at a distance of 2 km from the bus stand, this church is the largest church of the hill station. Dating back to 1909, St. Patrick's Church has a main hall, which has a seating capacity of around 300 persons. The officers and ranks of the British Army contributed largely to the inception of this church. 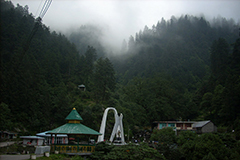 Panchpula is located at a distance of around 3 km from Dalhousie. One of the famous picturesque spots in the region, the word Panchpula means five bridges. It is the place where a descending stream pours into and feeds several pools. 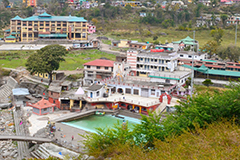 The main stream that supplies water to cities of Dalhousie and Balloon is the Panchpula stream. The stream originates from the northern side of Dayakund, which then cuts through a ravine to fall into the water bodies located in Panchpula. Kynance, a residential building is an important landmark, which is also recognised as a heritage site. 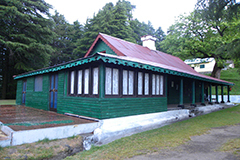 This building is the private property of Dharamvirs, which was constructed by Dr. N.R. Dharamvir of Lahore. Constructed in 1933, the building is historically significantly, owing to its association with the great freedom fighter, Netaji Subhash Chandra Bose. Subhash Baoli, located at a distance of around 1 km from Dalhousie has been named after Subhash Chandra Bose, the famous freedom fighter. In 1937, he had spent a lot of time in Dalhousie at this place. Subhash Baoli is a beautiful spot circumscribed by several and huge towering trees. 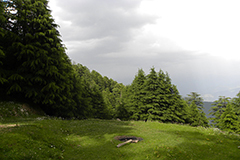 There are plenty of Dalhousie tourist attractions,things to see in Dalhousie, and one can choose from range of activities available or things to do in Dalhousie which can be a walk in the green forests areas, adventure treks. If you are searching for Dalhousie attractions,sightseeing in Dalhousie,best places to visit Dalhousie,things to see in Dalhousie,tourist places in Dalhousie by list,tourism point Dalhousie,tourist attractions near Dalhousie, places worth visiting Dalhousie, Dalhousie holidays, Dalhousie tourist spots, see Dalhousie Himanch Pradesh, best attractions in Dalhousie, tourist attractions in Dalhousie, local sightseeing in Dalhousie, attractions in Dalhousie Himanch Pradesh,places for sightseeing in Dalhousie,Dalhousie peak, places of tourist interest in Dalhousie,what to see in Dalhousie,sightseeing around Dalhousie, list of famous tourist spots in Dalhousie Himanch Pradesh,Dalhousie sightseeing places your search ends at allseasonsz.com for the likings of all age groups. There are tourist places near by Dalhousie offering majestic views of Himalayan peaks.Allseasonsz.com Himanch Pradesh best travel agents required for making your Dalhousie trip memorable. Whether it is about sightseeing around Dalhousie, Dalhousie excursions, Dalhousie places to visit, tourist attractions around Dalhousie-Allseasonsz.com Himanch Pradesh is convenant to propose amazing Dalhousie Packages offers and deals for your tour.